This sport-weight pullover has many traditional design details, as well as a few modern adaptations. Featured techniques include Channel Island Cast-on, Underarm Gussets, Knitted Bound Off Shoulders, Inverted Triangular Neck Gusset. Six sizes. 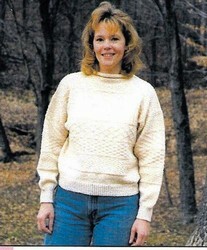 Uses traditional Guernsey 5 ply or Sport weight yarn.